Into the Woods › I signed a contract to build my house! I signed a contract to build my house! 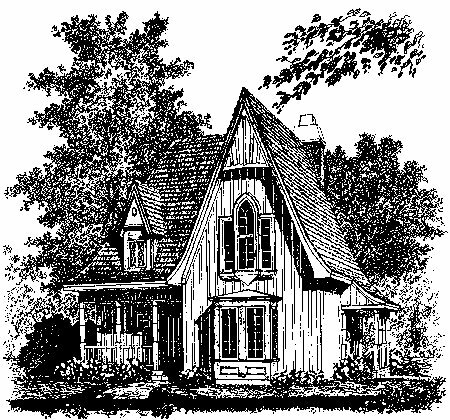 I signed a contract today with a construction company in King (also in Stokes County) to build the exterior of my gothic cottage. I also got the building permit from the county today. The construction company is eager to start, so work on the foundation may well begin this week. As I mentioned in an earlier post, a metal roof, flared at the eaves, was just too expensive. I’ve ended up with a conventional 30-year roof. The roof will be dark green. The exterior of the windows and doors also will be dark green. The siding and trim will be rough-sawed white pine. The white pine, when newly sawed, is a cool yellow color. After a few months of exposure to the sun, the pine takes on a warm, golden hue. Then gradually over the years the siding will turn gray. The people in the Stokes County building permits office, when I commented on the low cost of the building permit, said that it has been a long time since they’ve issued a permit for a house this small – 1,250 square feet. The permit price is based on square footage. I’m kind of honored, actually, that in Stokes County, North Carolina, which is far from a rich county, I’m building the smallest house that anybody has built in a long time. This was written by daltoni. Posted on Monday, August 11, 2008, at 10:20 am. Filed under Sustainable living, The house. Bookmark the permalink. Follow comments here with the RSS feed. Post a comment or leave a trackback. ‹ Rough hurricane season ahead?